Original gouache on paper by Harold Cohn of young woman. Size of this wonderful painting is 17 7/8 x 11 3/4. An exciting, superbly rendered work. COLLECTIONS: Boston Museum of Fine Art; Detroit Institute of Art. Mughal miniature art real gold(Hikali - Gold Ink). Fine Quality miniature work. The actual color may differ a bit because of screen resolution and light effect. Piece of original art from New Orleans' famous French Quarter artists' colony in Jackson Square. Beautiful Gouache painting on paper by artist Claude Rodewald b 1923. Painting is in excellent condition except for waviness to the paper, does not detract. The style is very similar to Marc Chagall. Painting. Gouache on Paper. Signed by Dellar. Free Shipping. Somber colors. Two figures walking in perhaps a heath. Signed by Dellar. Most likely Roger Dellar, as the style is similar. A few minor nicks in the frame. FREE shipping to the lower 48 United States. Inquire for rates to other areas. Will be packed carefully. We have a small masterwork from India. 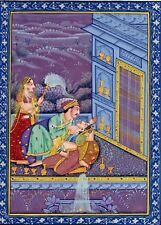 This is one of the best examples of Mogul miniature painting Hulinsartgallery has found outside a museum display. The colors and brush work are superb.The iconography is clearly depicting a young woman, with attendants, making herself beautiful. ORIGINAL GOUACHE PAINTING ON ILLUSTRATION TYPE BOARD. DATES 1930'S. GREAT CONDITION. HAND PAINTED BORDERS AS SHOWN. I CANNOT FIND ANYTHING ON THIS ARTIST BUT HE WAS OBVIOUSLY A TRAINED PAINTER. Overview : SIGNED AS SHOWN. VERY WELL DONE. OIL ON CANVAS. DATES MID CENTURY. LOOKS RESTRETCHED YEAR LATER. Samuel Collection. Sign Alexandra Exter. Russian French Avant Garde Sketch. Gouache, Pencil on paper. Condition is good. Politi (1908-1996) was a noted Los Angeles artist and illustrator. EXHIBITIONS: Milan Art Institute, 1924; Art Institute of Chicago, 1937; Watercolor Annual, Pennsylvania Academy of the Fine Arts, 1937; Society of Independent Artists, 1937; Delphic Studios. GOOD CONDITION. DATES AROUND 1960'S OR SO. GOUACHE ON PAPER. The painting depicts the performance of the "Soviet Folk Dance Theater". Painting created circa early 20th century by Mstislav Valerianovich Dobuzhinsky or Dobujinsky (Lithuanian: Mstislavas Dobužinskis, 1875-1957) was a Russian-Lithuanian artist noted for his cityscapes conveying the explosive growth and decay of the early twentieth-century city. Fantastic composition by Felicita Frai! This is a fine example her work in very good condition for its age. Felicita Frai (1914-2010). Felicita Frai (Prague, 1909 – Milan, 2010) was a Czech painter. It is done in Bosa's very unique and recognizable style. Born in Codroipo, a small village only a few miles from Venice, Italy in 1905, the son of a stonemason. He then studied under John Sloan, of the Ashcan School, at the Art Students League in New York. POSITIONS: Professor of art, Hampton Institute, Hampton, Virginia. EXHIBITIONS: participated in over 15 major exhibitions around the United States including: Virginia Artists Rotating Exhibition, Virginia Museum of Fine Arts, 1956, 1961; Norfolk Museum. Original ink on paper by Louis Rosenfeld of a dock worker. POSITIONS: Professor of art, Hampton Institute, Hampton, Virginia. EXHIBITIONS: participated in over 15 major exhibitions around the United States including: Virginia Artists Rotating Exhibition, Virginia Museum of Fine Arts, 1956, 1961; Norfolk Museum. Original airbrush on paper by Louis Rosenfeld of ballerinas. POSITIONS: Professor of art, Hampton Institute, Hampton, Virginia. EXHIBITIONS: participated in over 15 major exhibitions around the United States including: Virginia Artists Rotating Exhibition, Virginia Museum of Fine Arts, 1956, 1961; Norfolk Museum. This wonderful painting is a genuine gouache on paper by listed artist ELENA M. DE HELLEBRANTH created between 1940-1948. Stamped on the back “Estate of Elena and Berta de Hellebranth. This quick, spontaneous and emotional painting creates distinct areas of color on the canvas. Artist / Maker: Guy Seradour. Signature / Marks: Guy Seradour. Gouache painting of two young ballerina girls who are preparing for a performance. The work is signed by Guy Seradour. Gouache painting of two young ballerinas. Mikhail Vasilevich Le Dantu/ Ledantyu (1891-1917). Sign Le Dantu. Russian Avant Garde Oil Painting. In January 1912, Le Dante decided to take the step and it breaks with the Academy of fine arts; went to Moscow, together with his new friends involved in the preparation of the famous, the scandalous exhibition « Donkey's tail», where young and talented rebels M. F. Larionov, N. With. THANK YOU FOR VISITING OUR STORE. WE ARE ALWAYS OPEN TO OFFERS. WE ARE CONSTANTLY LISTING NEW ITEMS DAILY SO CHECK BACK WITH US TO SEE IF THERE IS SOMETHING YOU LIKE, THANK YOU. We offer for sale today this interesting, genuine artwork created from European artist. Gouache and pastels on paper, painted approximately 1970 - 1980. Measures - 60 cm high x 45 cm width approximately 24 x 18 inches, unsigned. Condition - folds, wears and scratches. We value our customers so that if you have a problem we are always here to offer help.If there is any problem I ask that you please contact me before any other action. We will try to work it out with you if at all possible. Please be fair, we cannot be responsible for everything but we can help every concern to be resolved friendly. She worked for Harpers Bazaar and as a fine-art painter exhibited at the Pennsylvania Academy of Fine Art and the Art Institute of Chicago. I am committed to your positive buying experience. I appreciate your courtesy! More pictures are available! Overview : ORIGINAL GOUACHE PAINTING ON BOARD. See photos. Mughal miniature art real gold(Hikali - Gold Ink). Paper painting : Love scene Young price and princess. Young Emperor and Empress Enjoying the evening. The Emperor is serving the wine to the Empress. 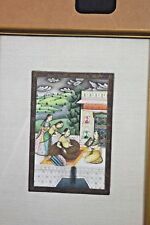 Pair of 20th Century Indian Gouache Miniature Paintings. Circa: early 20th century. These paintings will look fabulous in any room. Beautifully painted decorative poetic paintings. The "two Girls" by B. Stiles a unknown Artist is a sweet rendition of these two beautiful Girls. GOUACHE ON BOARD. DATES 1970'S. A GREAT ORIGINAL PAINTING. Condition : GOOD CONDITION. See photos. Signed Carol Blanchard. 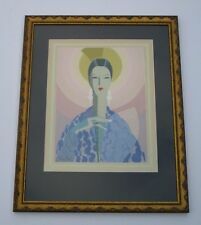 This painting was created for Conde Nast Publications, possibly for Vanity Fair, Vogue or Glamour magazine. Very good condition with a tiny tear on right edge. FREDERICK LYNCH (Am 1935-2016) Paddle, 1983 gouache exh. Barridoff-private coll. Barridoff Galleries, Portland, Maine, 1983. NB.One of Maine’s most highly regarded contemporary artists, Frederick Lynch received a degree at Massachusetts College of Art. By 1972, he had moved to Maine, where he lived and worked for the rest of his life. Picture:12"x8.5". Very good condition. Paintings with glass will be protected with tape, extra cardboard, and bubble wrap. Original watercolor and gouache on illustration board by Laura Grenier of older woman in colorful dress. Size of this wonderful painting is 18 1/2 x 15. Signed and dated '77 lower right. Gouache on cardboard. The artist graduated from the Kiev art institute in 1955, V. Kasiyan was his teacher. Picture of the 70 th years. Since 1959 he participated in republican and international exhibitions. I have not researched whether it is totally original or a reproduction of another painting. In any case, it is a nice piece of work and the matting is deep cut and professionally done. I don't clean or polish. Signed on back J.F. Mullen. Mid century painting of a young girl with a hat. Creation period: beggining of XXI century.